As we move closer to sending The Fantasy Trip to the factory, some of us in the office are preparing tools for upcoming demos. (Also, it gives us a good excuse to play with miniatures, terrain, dice, and more fun stuff.) We've already shared some of the Hirst Arts terrain that we've been constructing in the office, but terrain can only take a demo so far. We need miniatures to use with that terrain, and a current project at Kickstarter recently caught my eye with its fun, twisted take on some traditional monsters. 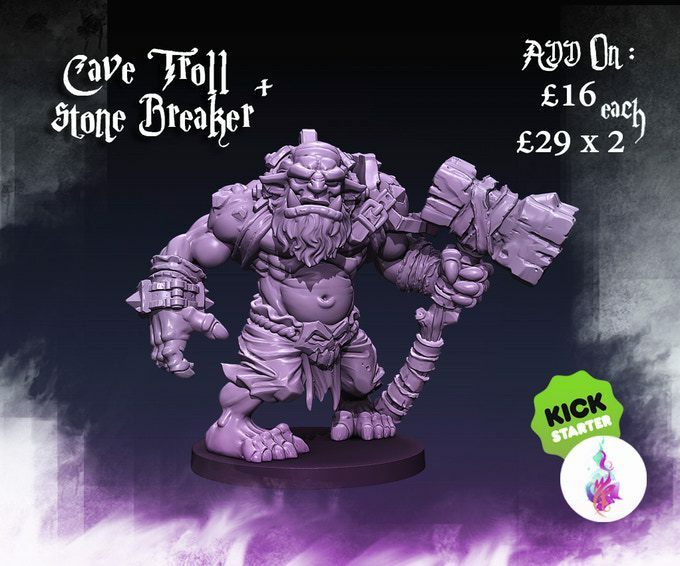 Trolls, Goblins, and Orcs by Motion in Poetry Games closes in a few days, so you're almost out of time to join in and help make these resin monster miniatures a reality. My favorite of the revealed designs has to be the Cave Troll, but I can't deny that the Gribbling Pup is adorable; what party of adventurers could bring themselves to slaughter such a cute little beastie? Are the player characters the monsters if they chase down the little guy?